Making the choice to switch to reusable grocery bags can lead to some pretty significant environmental changes but hey, you already know that and that’s exactly why you made the decisions to ditch disposable plastic bags. 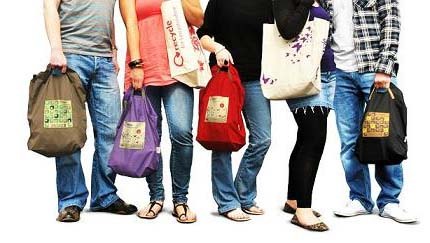 Remembering to bring your reusable bags with you when you go shopping is another story. Like any habit, the key to remembering to bring your reusable grocery bags when you head to the store is repetition. You need to continually grab your bags, so eventually you don’t think about it, you just do it. This can take some getting used to, and if you find yourself at the checkout without your reusable bags, it can be tempting to use plastic bags just this once – but resist the temptation! We’ve rounded up some facts about plastic to help your remember to bring your reusable bags and enforce this habit. Plastic Never Really Goes Away. When plastic is recycled it is turned into – wait for it – more plastic. Recycling plastic is a good solution, but unfortunately, most plastic is not recycled. The majority of plastic ends up in landfills or as litter or in our food chain. Plastic does not safely break down. When exposed to the elements it will break apart into smaller and even smaller pieces of plastic. The Garbage Patch is Real. It almost seems like an urban legend but there are actual flotillas of trash floating in the oceans. The notion of a garbage patch conjures ideas of a solid, island-like mass, and that is not the case. The garbage patch is more like a garbage soup. Pieces of plastic and other trash get caught up in the currents and are spun together into a large mass of floating trash. Single-Use Plastic Bags are Typically Used for 12 – 20 Minutes. That’s not a lot of time, especially given the long-lasting impact plastic can have. In the U.S. About 1 Billion Disposable Plastic Bags are Thrown Away Each Year. This is a whole lot of plastic and works out to dumping about 12 million barrels of oil, which is just a wasteful way to use this non-renewable resource. Retailers Spend More Than $4 Billion Each Year on Disposable Plastic Bags. That’s a lot of money and this expense is passed along to the customers, so customers are really the ones paying this expense. A lot of stores give discounts to shoppers who bring their own reusable bags. You may end up saving maybe 5-cents per bag, and that may not seem like a lot, but over the course of a year that can really add up. Hopefully these facts will inspire you to always bring your reusable shopping bags and reinforce the habit of using reusable bags. For even more inspiring tidbits check out this Huffington Post piece and if you re ready to create a custom reusable bag for your brand or retail outlet, visit us HERE or call us at 866.222.0949. Guess What Was Found at the Bottom of The World’s Deepest Ocean?